In 1866, a local man, William Carroll, provided funding for a Convent and school to be built in Tramore. Both buildings were aptly called ‘Star of the Sea’ and are still located on the original sites. The Convent was occupied by the Sisters of Charity in June 1866 and the school opened in September 1866. The Christian Brothers followed in 1867 and with a generous donation from the same man, William Carroll, they opened a school with an adjacent monastery. The Sisters of Charity were founded by Mary Aikenhead in 1815. Mary was a Cork woman with undaunted courage, great vision and unshakeable faith in God’s Providence. Her motto was ‘Caritas Christi Urget Nos’ (The Charity of Christ urges us on.) This motto is treasured by the Sisters of Charity worldwide and is engraved on the crest of the Congregation. At that time in 1866, Ireland was emerging from the Famine having suffered great sorrows and mass emigration. Then, in the years that followed, Ireland moved towards establishing independence with the Easter Rising and the Civil War to finally gaining independence and establishing a modern State. Two centuries of dramatic history! The school thrived with the children enjoying a varied and wholesome education: the records for the time tell us that ‘the children were intelligent and most anxious for their own improvement.’ As well as learning the regular school subjects, many wonderful musicals and operettas were staged in the hall. In working with many dedicated colleagues and supporters, much of this work continues today. For this, we give glory to God. As we mark this moment of history in the beautiful town of Tramore, it is indeed a time to give thanks to God for His faithfulness over the years. 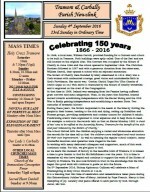 It is a time to remember all who have helped and continue to support the work of the Sisters of Charity in Tramore. We also look forward in trust in the knowledge that He who began this good work will continue to guide us into the future. On 8th September 2016, Bishop Alphonsus Cullinan will celebrate a Mass of Thanksgiving in Holy Cross Church at 11a.m. It is a blessing that this time of celebration and remembrance takes place during this Extraordinary Jubilee Year of Mercy, initiated by Pope Francis. Mercy is that wellspring of joy, serenity and peace offered to each person by God, through Jesus, His Son.